Printing hang tags for your merchandise gives you the ability to communicate your marketing message to a customer trying to decide whether to buy your product. Adding a custom hang tag to your apparel gives you the ability to give customers more information about your product. 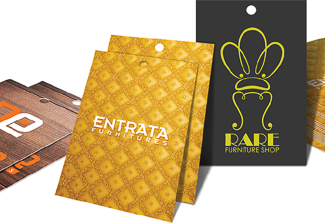 Consider printing hang tags that highlight the features and benefits of your products. Companies that attach hang tags to their products find that their merchandise sells faster. A professionally designed and printed hang tag can enhance the perception of your product and reinforce your brand at the point of purchase. Hang tags are available in a wide range of sizes.